In a large bowl combine the beef, chiles, bourbon, bacon bits, a pinch of salt and pepper. 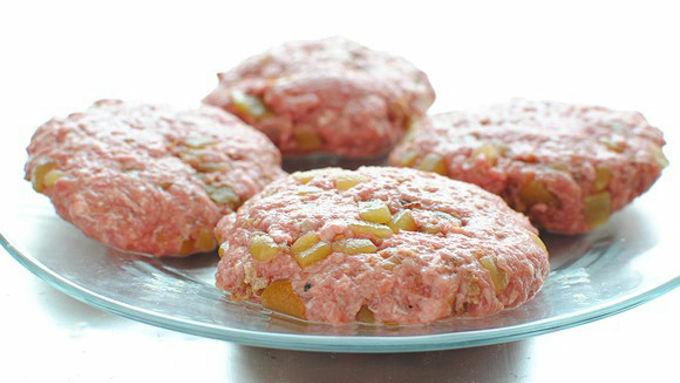 Mix with your hands until well combined, then form four equal patties. You can either marinate these in the fridge for a few hours, or start grilling immediately. Preheat the grill to a medium-high and grill burgers until cooked through, or your desired doneness. 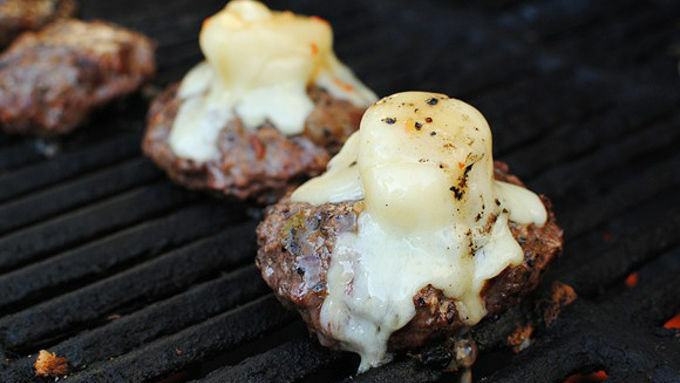 Once you flip the burgers, add the cheese so that it melts in the grilling process. Grill the buns as well until you get good grill marks. 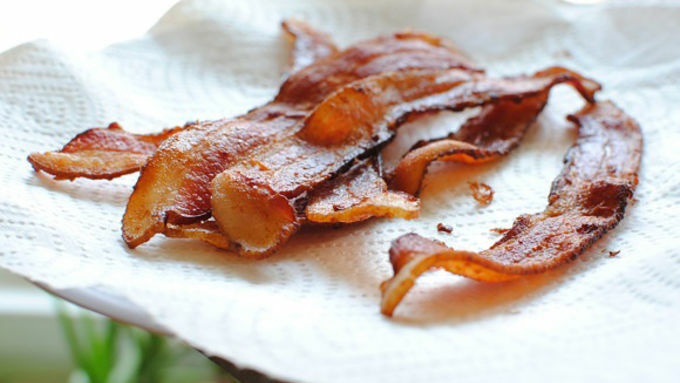 In the meantime, render your bacon in a medium skillet over medium heat until nice and crisp. Transfer to a plate and pat dry. Break in half so that you have a few pieces for each burger. 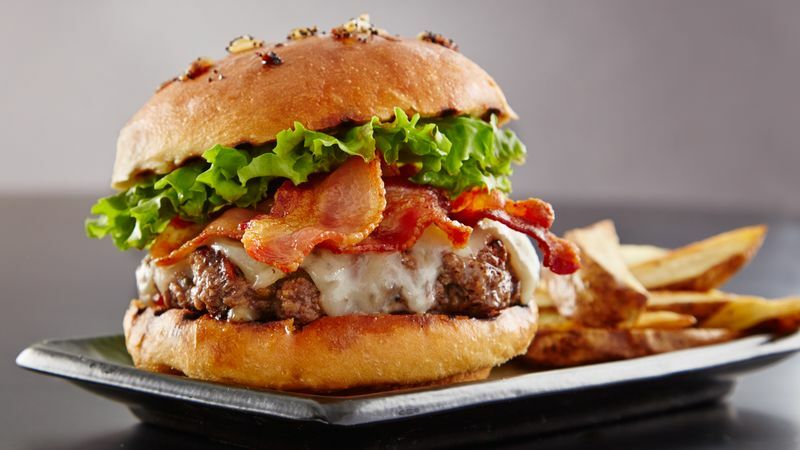 Serve burgers garnished with bacon and crisp romaine lettuce! Did you just go blind looking at this fabulous burger? Good. Let's talk about indulgence for a kiss. I like it. I need it. It's healthy! It is. Even Julia Child herself confirms this with her beautifully notorious quote, "Everything in moderation. . . including moderation." Oh, I like her too. Indulgence brings on the giddy pants. It makes your eyes do backflips on their way to the back of your skull where they remain as you speak in tongues and collapse and melt into a pile of happy human goo from sheer satisfaction. Of course indulgence is only meant for special occasions. Or as I like to call it, life. 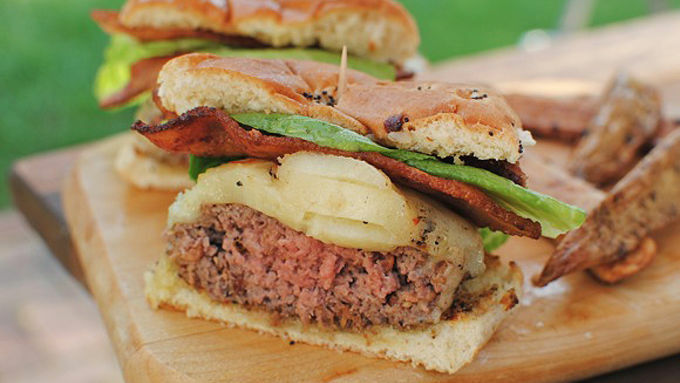 Now let's talk about these Grilled Bourbon Bacon Burgers. I mean if we even can. By now your mouth has most likely turned into a pond of drool in which you could probably go fishing in. Beef. Bacon. Bourbon. Green Chiles. Melted Aged Cheddar. Onion Buns. Yes Everything Needs To Be Capitalized. Let's make them before you slip into a coma. Grab some beef, some bacon (not pictured because I was already so excited about making these I blacked out), some bacon bits, some Old El Paso diced green chiles, aged white cheddar, some BOURBON (hey! you just sipped it. well, okay. ), some crisp lettuce and some onion buns. Indulgence. You should totally get into it.